I didn’t think I was going to share our holiday home decor this year because in all honesty, I’m not that thrilled with it. All the pieces didn’t come together this year like they usually do, so I finally just accepted that it was going to look the way it does for this season. But, hey – that’s reality, right?! And, I’m trying to be better about not always striving to achieve perfection and only sharing the “pretty” stuff. What fun is that? So, here’s our home at Christmas – flaws and all! Let’s start in our front sitting room. No shock here – it’s my favorite spot! With the exception of the coffee table, this room always comes together for me piece of cake. Probably because I don’t swap out every single piece of decor. And, our flocked tree just makes everything so much better and winter wonderland-ish. 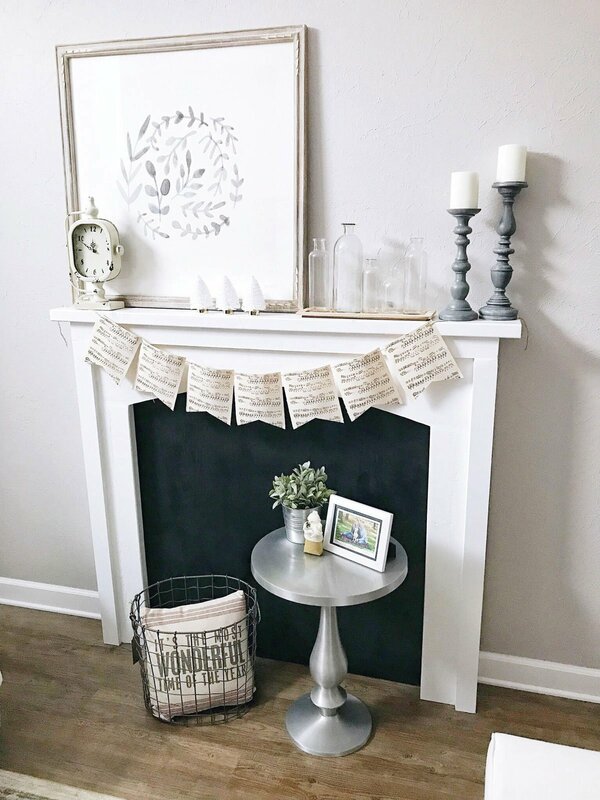 I was able to snag some new bunting from the Target dollar spot for the faux fireplace mantel. I’m not sure why musical notes work for decor, but they just do. I’ll probably keep that up all winter long. 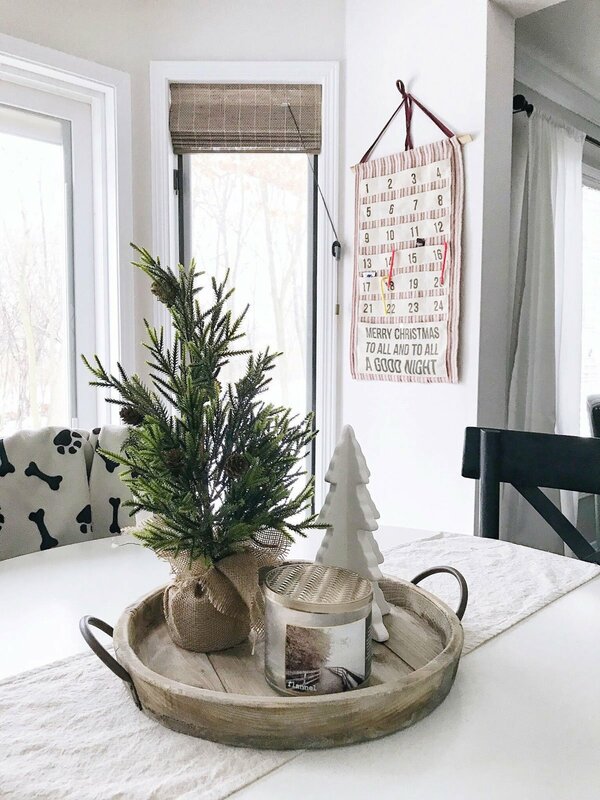 I also put this year’s Christmas card in a frame for the little table – it’s an easy way for us to enjoy it all season! The dining room currently is a lost cause because our table is the puzzle table. Fine by me since we hardly ever use that space unless we have company. 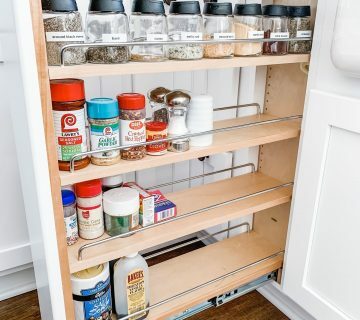 Moving into the kitchen, I love pops of red in this space because it’s such a bright and fun contrast to all the white. 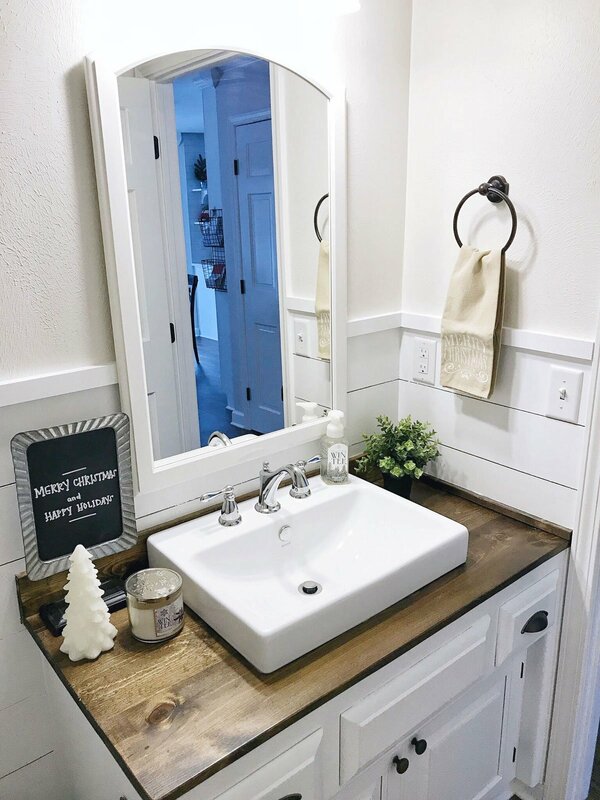 My floating shelves are usually where I have the most fun with decor, and the little greenery box makes for the perfect catchall next to the sink. Nothing too crazy on our kitchen table, but if you haven’t tried the Flannel candle from Bath and Body Works then you’re missing out! I already have a new one on standby. So, so good. Ryan and me also decided to do an advent calendar this year. I took the odd days and he the even days. It has been so fun and cute to wake up every morning to see what little treats we leave each other. Here’s another quick shot of our half bathroom decor. 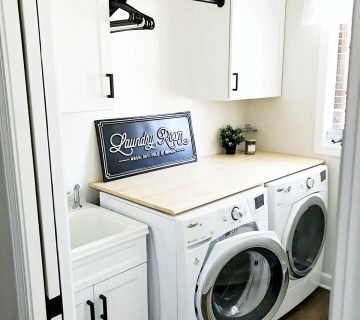 You can see more of our recent updates to this space in this post. 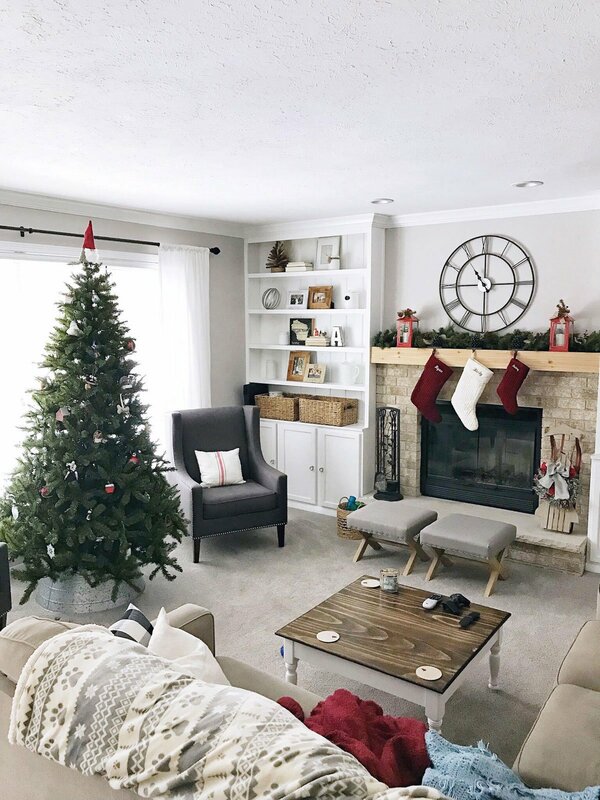 I don’t know why I hardly ever share about our family room on here or on Instagram – probably because it’s usually a mess! Ha! Definitely keeping it real in this photo with all the unfolded blankets. This is where we spend most of our time, so it should be lived in. And, I love our family tree with all our childhood ornaments and ornaments that we’ve started as a couple/family. We collect ornaments from all our travels, so it’s fun to reminisce about our adventures while we decorate the tree! Last but not least, I added a few winter touches to our master bedroom. It didn’t take much – I got a new duvet cover, accent pillow and threw some greenery over the bed. Easy peasy! We also have a little 4′ tree in the corner, but that didn’t make for the most interesting picture so use your imagination. I hope that you enjoyed our home at Christmas! Even though I’m not super into all my decor this year, there’s no denying that the decorations make the house feel extra warm and cozy. And, there’s no better feeling than that! 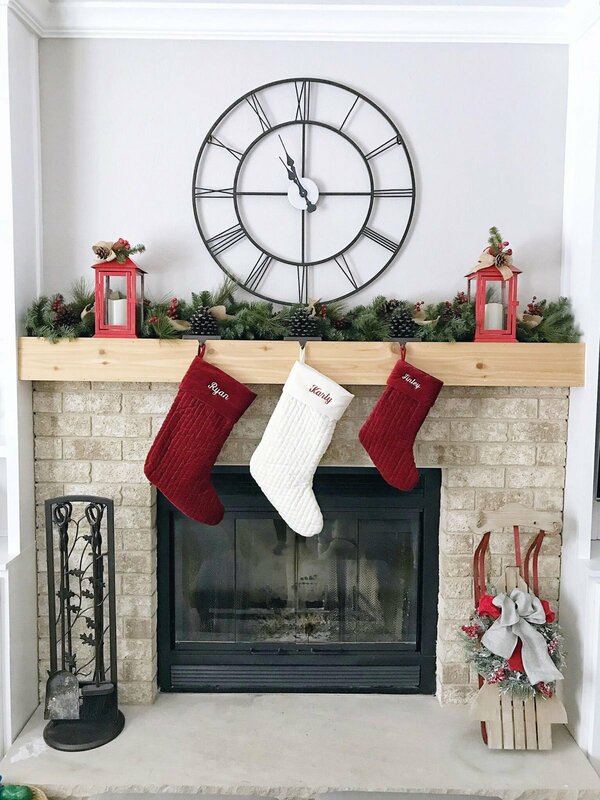 Did you share photos of your holiday home decor? Leave me a link so I can go see! Psst – I didn’t bother with a source list because most of my decor is stuff I already had or from places like TJMaxx, Joann Fabric, etc. If there’s something specific you want to know about, just shoot me an email! Looks amazing! Love all the decorations! So when I buy a house can you come over and decorate for me? I love this style of furnishing and decorating. I think your house looks so great! 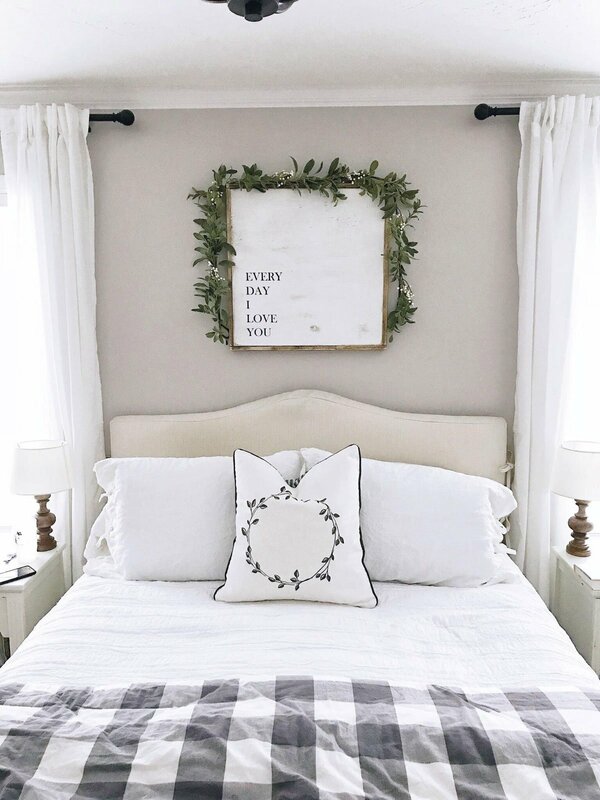 I love the greenery over the sign in your bedroom, I think you could keep that up all year! Thanks so much! 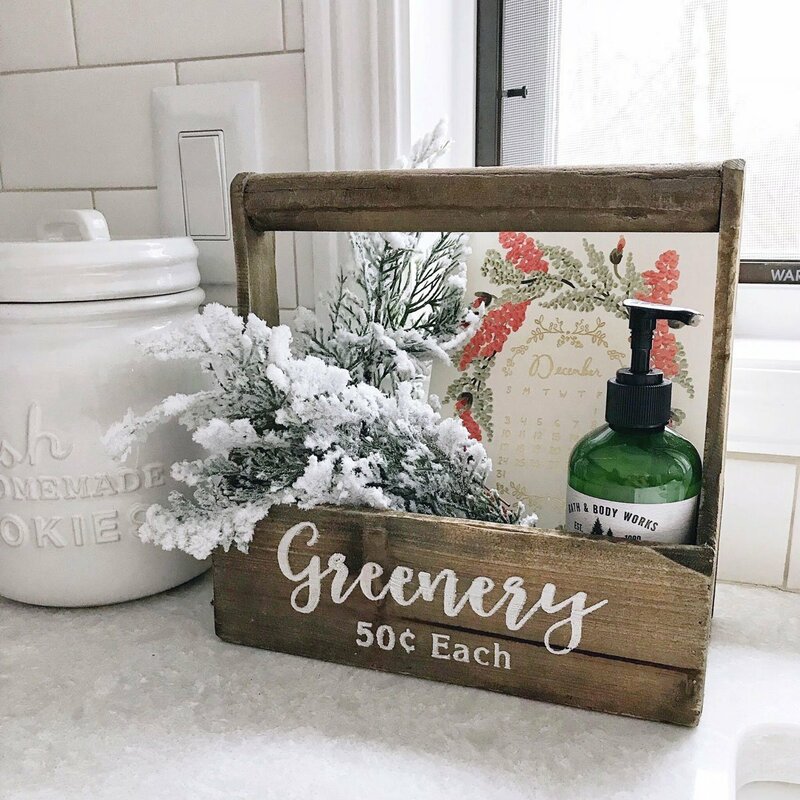 I know, I might have to make the sign greenery a year round touch! Your home is so beautiful! I love the holiday decorations! And I’m jealous you have 2 trees! Thanks, girlie! Most people think it’s ridiculous that we have two trees, haha. I actually grew up with that – our family tree and “fancy” tree – so I think that’s why I always wanted to do it myself! Your home is so beautiful!! Absolutely love how your decorated it for the holidays. So pretty, right? It goes perfect in that room! Everything looks great! Even if it didn’t come together the way you imagined, the simplicity & pops of color are perfection. I hope you have a great holiday! Thanks, Brittany! 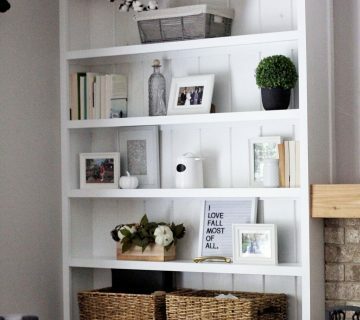 I think because I don’t completely overhaul my decor that I think that it’s not “enough,” but you’re right that the pops of color and simple stuff stick true to my aesthetic. Have a wonderful holiday! I think you’ve understated how warm and cozy your house looks for Christmas this year! All your little touches really allow your home to shine through! Thank you! Still working up to your level, haha! 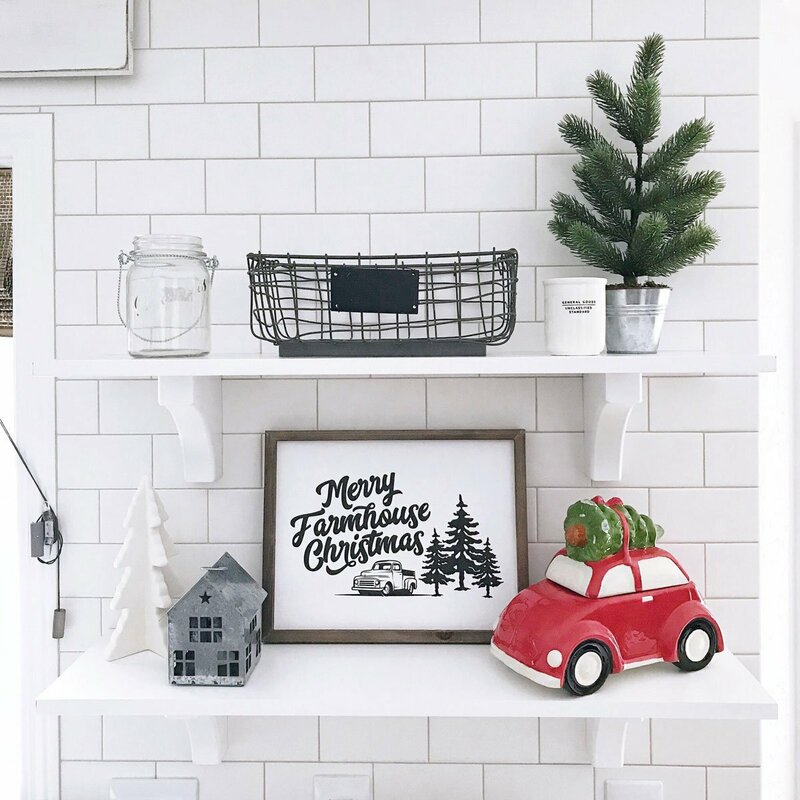 Your house is so gorgeous but it’s especially cute during the holidays! I love that Finley has a stocking too, so adorable! Awe, thanks sweet friend! The decorations do make it especially cozy. Finn loves his stocking and knows which one is his, haha! Honestly I love all your decor! It’s sooo cute! 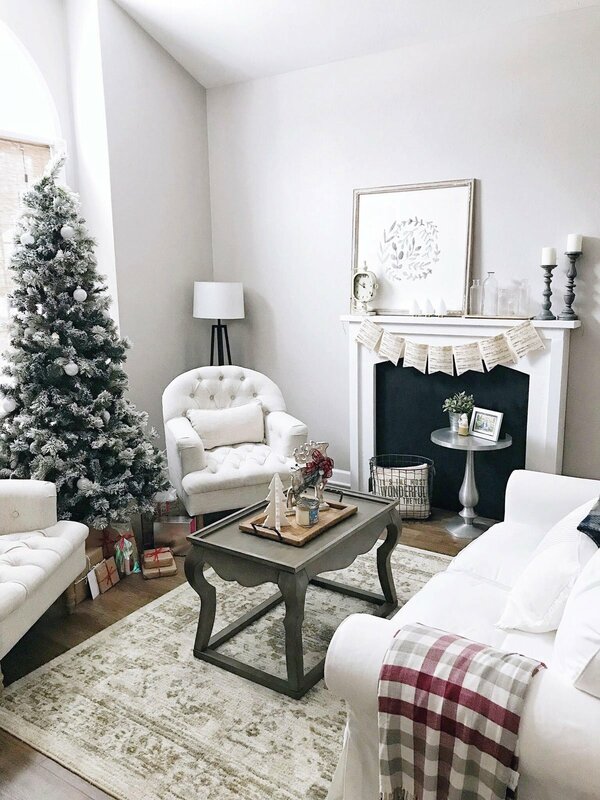 The farmhouse chic look is just adorable and I love all the winter white with pops of red and green. Merry Christmas to you all! Thank you so much! I’m definitely still deciding what holiday decor I love and want to find/buy, so I think that’s why I don’t feel like it’s quite there yet. But, I’m working on it! 🙂 Happt Christmas to you and your cute family!